I flew through this graphic memoir in one sitting. I was drawn in by the author's peculiar, ambiguous shadow metaphors and Biblical allusions, and was held in the story's spell by the deviation from a linear timeline and and the raw emotional honesty mirrored in the deceptively simple scribble-like artwork. The themes Finck explores are often difficult to express. She flutters around questions of identity and reality like the living shadow she so desperately seeks through the creation of, and at the heart of, this book. I'd recommend it to anyone who feels they don't quite fit in. A visually arresting graphic memoir about a young artist struggling against what’s expected of her as a woman, and learning to accept her true self, from an acclaimed New Yorker cartoonist. In this achingly beautiful graphic memoir, Liana Finck goes in search of that thing she has lost—her shadow, she calls it, but one might also think of it as the “otherness” or “strangeness” that has defined her since birth, that part of her that has always made her feel as though she is living in exile from the world. 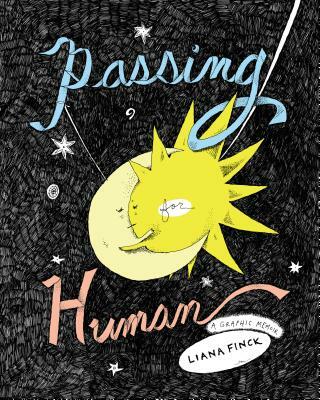 In Passing for Human, Finck is on a quest for self-understanding and self-acceptance, and along the way she seeks to answer some eternal questions: What makes us whole? What parts of ourselves do we hide or ignore or chase away—because they’re embarrassing, or inconvenient, or just plain weird—and at what cost? Passing for Human is what Finck calls “a neurological coming-of-age story”—one in which, through her childhood, human connection proved elusive and her most enduring relationships were with plants and rocks and imaginary friends; in which her mother was an artist whose creative life had been stifled by an unhappy first marriage and a deeply sexist society that seemed expressly designed to snuff out creativity in women; in which her father was a doctor who struggled in secret with the guilt of having passed his own form of otherness on to his daughter; and in which, as an adult, Finck finally finds her shadow again—and, with it, her true self. Melancholy and funny, personal and surreal, Passing for Human is a profound exploration of identity by one of the most talented young comic artists working today. Part magical odyssey, part feminist creation myth, this memoir is, most of all, an extraordinary, moving meditation on what it means to be an artist and a woman grappling with the desire to pass for human. Liana Finck is a regular contributor to The New Yorker, The Awl, and Catapult. She is a recipient of a Fulbright Fellowship, a New York Foundation for the Arts Fellowship, and a Six Points Fellowship for Emerging Jewish Artists. She has had artist residencies with the MacDowell Colony, Yaddo, the Lower Manhattan Cultural Council, and Tablet magazine. Her first book, A Bintel Brief, was published in 2014. “Passing for Human is one of the most extraordinary memoirs I’ve ever read. It’s a story about becoming a person, about creativity, about love, all told with originality and grace. An amazing, amazing book.”—Roz Chast, author of Can’t We Talk About Something More Pleasant?